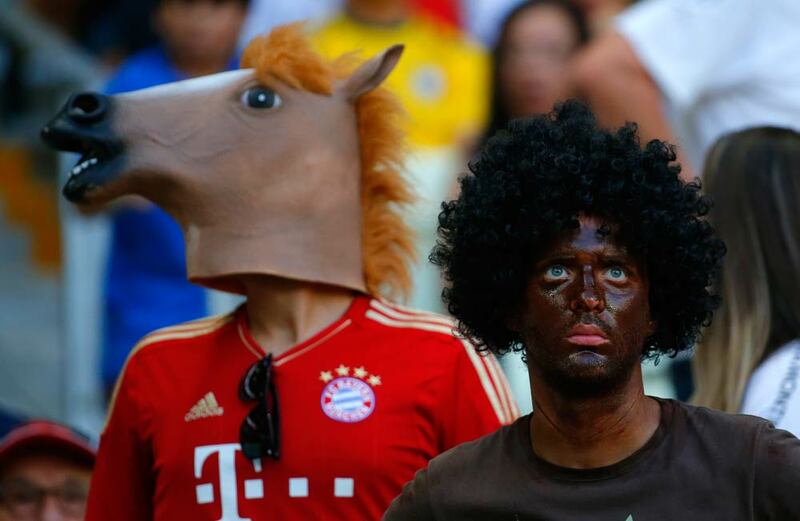 Fifa is investigating a possible racial discrimination case after photographs circulated of fans with blackface makeup at Germany’s match against Ghana. Images posted on social media networks showed two men, appearing to be Germany fans, with blackened faces in the Fortaleza stadium on Saturday. Fifa said on Sunday that its disciplinary committee is considering opening a case. It will also consider a report by the Fifa match commissioner, Eggert Magnusson of Iceland. “We do not respect any discriminatory messages,” spokesperson Delia Fischer said. Fifa holds national football federations responsible for their fans’ behavior inside stadiums. In a second incident, a man ran onto the pitch in the second half of the 2-2 draw. The shirtless fan had an email address and telephone number written on his back. He was ushered away by Ghana midfielder Sulley Muntari before being detained by stewards. Brazil’s organising committee spokesperson Saint-Clair Milesi said the man was reportedly from Poland. I personally find the individual in the photo dressed up as a horse more sickening! I cannot sleep at night wondering how horses feel about this insult ?